Why should we care who Clooney or the Duggar family wants for president? Hundreds gathered for the ceremony in Springdale, Arkansas, held in honour of little Jubilee Shalom. The reality stars discovered that their 20th child no longer had a heartbeat during a doctors appointment on December 8. Michelle, 45, had a natural miscarriage three days later. After the memorial, a family member shared a heartbreaking picture on Twitter in her memory – before the online post was later deleted. The photograph shows Michelle reaching out to touch daughter Jubilee’s tiny hand, with the juxtaposition of size deeply moving. While Michelle obviously displays a fully grown adult hand, Jubilee’s is incredibly tiny, with her palm half the size of her mother’s finger tip. ‘This is so sad, but I have peace. There are people praying for us and angels surrounding our home, and there was peace in the sorrow and the grief. 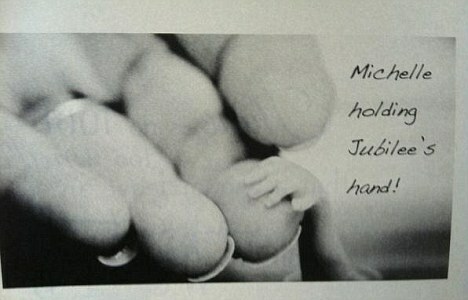 Radar Online report that Jubilee weighed just 4oz and measured 6cm when she was stillborn on December 11. Husband Jim expressed his sadness, but says the child is now in heaven. He said: ‘We won’t see this child’s life and the phases that we’ve seen for our other children, but we know we will see this child in heaven one day. The Duggar family continues to let their loyal fanbase in on the developments after Jim Bob and Michelle Duggar discovered that their 20th child had passed away while still in Michelle’s womb. Last Friday, Jim Bob posted a letter to the fans thanking them for their support and adding “we also know that God promises to work all things for good in our lives.” As promised, they’ve updated their readers and viewers with news of the memorial service for their child, who they named Jubilee Shalom Duggar. Surprising choice for a baby name, since “jubilee” brings to mind emancipation and celebration. However, “shalom” is a fitting middle name, since according to Merriam-Webster it means hello and goodbye. Even though the Duggars are saying goodbye to their daughter in this memorial service, Michelle and Jim Bob believe that they will meet her again in heaven someday. 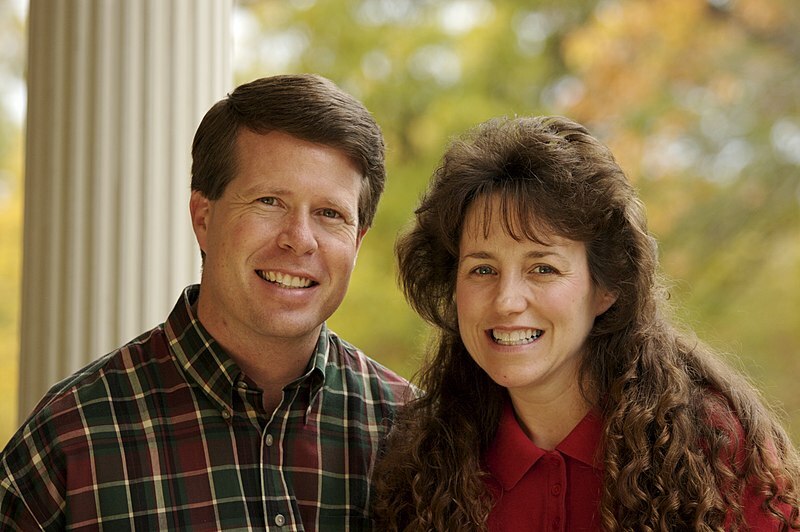 When doctors determined, during a routine ultrasound, that the Duggars’ baby had already passed away, they advised Michelle to stay home and let the miscarriage occur naturally. However, Jim Bob mentioned on the blog that Michelle began feeling lightheaded and went to the hospital last night. The large reality show clan already held a private memorial service for Jubilee; on Wednesday they will hold another one for family and close friends. No word yet on where or what time it will be, but it’ll be interesting to see if the paparazzi track down the location. Even after a tough week for the hardy Duggars clan, Jim Bob and wife Michelle are still finding ways to stay positive. The Duggar parents will be holding a memorial service for their unborn child on Wednesday, Dec. 14, whom they named, appropriately, Jubilee Shalom Duggar. “This is life, and I understand that we are going through something that many others have,” Jim Bob told People. “You think about the what-ifs, but God gives us strength to go on. Following last Thursday’s devastating news, Michelle felt lightheaded and was ordered to stay in the hospital for observation, a family spokesperson told People. “Our doctor said it was wise to let this miscarriage happen naturally,” Michelle, 45, said. “And so that is what we are going to do. In 2009, the family faced another precarious situation when their youngest daughter Josie was born premature at just 25 weeks. “She is a miracle baby and all of us, we are so lucky to have her,” Michelle said at the time. The couple, who already have 19 biological children between the ages of 2 and 23, have faith that this recent tragedy is not without reason, however. “As our whole family is grieving, we also know that God promises to work all things for good in our lives,” Jim Bob wrote in a letter that he shared with People. “Our prayer is that Jubilee’s passing will help us all realize that this life is short, and our relationship with Jesus is the most important thing.